Cooking for good, have you heard about DinnerPartyYVR? 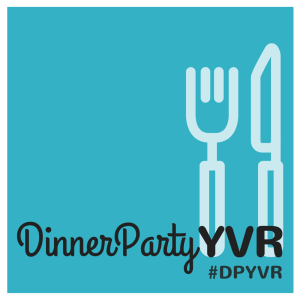 DinnerPartyYVR is a great opportunity for those of you who love to cook, host dinner parties and have a favourite cause you would like to support. Hobby Chef registration is open until Saturday, January 31 and the dinner parties take place Saturday, April 9. Net2Van committee member Michelle Sklar caught up with DinnerPartyYVR organizers Crystal Henrickson and Annika Reinhardt for a chat about coming into year three of this awesome fundraising event. Tell us a little about DinnerPartyYVR and what the inspiration was for you to launch this? DinnerPartyYVR is Vancouver’s largest simultaneous dinner party event supporting charitable causes. On one night, homes across Vancouver will cook and host dinner parties for old and new friends. 100% of the ticket sales will benefit chosen charities. I remember Annika (my co-producer) and myself having a lively brainstorm while eating burgers at the Jericho Beach Club a number of summers ago. The topic? How to create more opportunities for Vancouverites to connect. We both love hosting and attending dinner parties — it’s actually how we met — at one of Annika’s progressive dinner events. By the end, we’d decided to produce a simultaneous dinner party event, where anyone could attend and be almost guaranteed to meet a new friend! Do I need some mad cooking skills to be a Hobby Chef? You don’t need to be a professional chef to be a Hobby Chef. You just need to be up for hosting people in your home and serving a meal that you feel confident cooking. And no one should cook alone… we insist you pair up with a “sous chef”… a friend, a family member, a spouse. And along the way we’ll support you too: you’ll be invited to events at Whole Foods Market to help sharpen (haha pun!) your kitchen skills, past Hobby Chefs will share their “hacks” on our Facebook group, and you’ll even get a bag full of goodies including a gift card from Whole Foods Market, beer from Howe Sound Brewing, wine from Serendipity Winery and soda from DRY Sparkling to help complement your dinner party. How can I get my favorite charity involved? We think it’s special to see the variety of our hobby chefs, from the food they cook to the charities they support. With over 50 homes cooks, we might end up with just as many supported charities. No matter what the charity — provided you choose a registered charitable organization — 100% of the ticket sales from your meal will be donated to them. We encourage our hobby chefs to reach out the charities they are supporting and we personally invite all of the supported charities to the after party that follows so they can participate! Do I need to sell my own tickets? Spreading the word is a joint effort, because sharing is caring! We’ll be working hard to sell out like we have for the past 4 years. 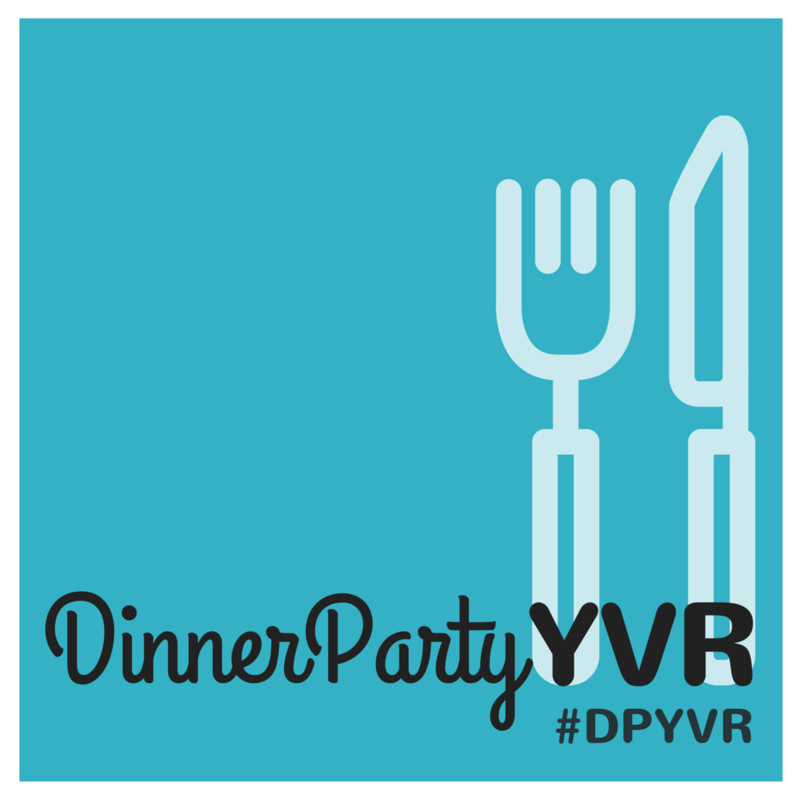 All of the meals will be displayed on dinnerpartyYVR.com where diners will get to select their top choice for a meal. After the event, we donate 100% of the ticket sales to the designated charities. Do you have a favorite story from a past DinnerPartyYVR you would like to share? You know, it’s been a pretty remarkable year of connections made because of past DinnerPartyYVR’s: we’ve heard of relationships starting at the DinnerPartyYVR after party, hobby chefs going on to cook professionally, and diners being inspired by charities who attend or host the dinner parties that they began volunteering with the organizations. I heard the after-party last year was a blast, what surprises do you have in store for us this year? We do like to throw a good party! We promise there will be a bar, delicious bites for desserts, great music, and the opportunity to toast to all of the dinner parties. The rest… you’ll just have to attend to find out! This entry was posted in Community Manager Forum, Monthly Updates and tagged cooking for good, event, fundraiser, nonprofit on January 26, 2016 by Michelle Sklar. Wanna be a Community Manager? This entry was posted in Community Manager Forum on February 6, 2015 by admin. Crowdsourcing calls on people who are otherwise not connected to contribute in a small way toward a common goal. We see this on the web all the time, from Kickstarter to Threadless T-shirt design competitions. Like a donation, asking an online community member to contribute in some form to a larger project better connects them to your project outcomes and your organization’s mission. Apply a cultural or artist lens to crowdsourcing and you have the potential to build something beautiful, meaningful, using many hands and a collective hive mind. Online Community Manager Theodora Lamb and Creative Digital Strategist Samantha Langdorf will demonstrate how important it is to engage your online communities through crowdsourcing and how drawing out the artistic talents of your community members can help build momentum around your organizations’ mission or cause work. 6:30 – 7:30 PM: The main event! Theodora’s passion for community organizing connects her social change values to her experience engaging online audiences. She’s worked with non-profit organizations including the BC Children’s Hospital Foundation as an on-air host and digital producer for their annual Miracle Weekend Telethon. She’s also developed online communities for Mountain Equipment Co-op’s TheBigWild.org, Family Services of Greater Vancouver, the BC Mental Health & Addictions Services, the Women’s Health and Research Institute and the Educational Resource Acquisition Consortium of British Columbia. Samantha is the Creative Director at Briteweb, a digital agency that delivers values-driven communications and digital solutions that engage audiences and build team culture. As Briteweb’s Creative Director, Samantha works with game-changing organizations to help them discover original and impactful ways to speak about themselves and their work so they can stand out, achieve their conversion goals and gain a following of both quality and quantity. Samantha is a lover of storytelling and devours stories in every form, from Ayn Rand to This American Life. In her free time, she teaches children creative writing with the Vancouver non-profit Writers’ Exchange, dances flamenco and daydreams about her next trip to Paris. Mobility Access: This venue has ramps and elevators and is wheelchair accessible. This entry was posted in Community Manager Forum on April 17, 2014 by admin. This entry was posted in Community Manager Forum, Event report on March 3, 2014 by admin. This event is for marketers, communicators, nonprofits and everyone else who wants to host amazing events. Where: Executive Briefing Centre at SAP, 910 Mainland St, Vancouver, BC. Kei Baritugo is an accomplished communications professional with 10 years of local, national and international experience in the arts & entertainment and nonprofit sectors. A lover of “What if’s” and “Aha!” moments that challenge conventional thinking, she specializes in generating strategic solutions for her clients. Her boutique public relations agency, BoldLove Communications, has provided outstanding services to award-winning clients at notable events such as South by Southwest, Cannes Film Festival, The Vancouver Olympics, JUNO Awards, and Sundance Film Festival, to name a few. In her spare time, she is a contributor for The Vancouver Observer, covering film, music and technology. This entry was posted in Community Manager Forum on February 13, 2014 by admin. A friendly fireside chat with some of Vancouver’s powerful proponents of brand culture. This talk will discuss the benefits of reaping a strong internal culture and what effects these activities have on the bottom line. Lima Al-Azzeh is the Marketing & Communications Manager at Invoke: A Digital Innovation Company. By day she’s helping clients build meaningful connections and find their voice online. By night she’s in adamant analog mode and volunteers her time towards local storytelling initiatives like Rain City Chronicles and A Good Book Drive. This entry was posted in Community Manager Forum on December 6, 2013 by admin. [Event Report] Community Management: Who’s Afraid of the Big Bad Data Wolf? This entry was posted in Community Manager Forum, Event report on November 29, 2013 by Erika Rathje. Community Management: Who’s Afraid of the Big Bad Data Wolf? The words data, analytics and metrics need not strike fear into the hearts of Community Managers. Let’s talk data – big and small – and discuss how, what, where, and why to measure the activities and results of community management. We will discuss tools, tips, tricks and time savers, how to avoid measuring for measurements sake, and ways to accurately show the value behind community management. As the Director of Community at HootSuite, Destin helps to drive and nurture the company’s global growth at a grassroots, community level. Through this global outreach she helps to build connections with, and between, the more than 8 million plus users – one user at a time. Prior to coming to HootSuite, Destin spent time as a social media strategist and community manager – both at a local Vancouver social media marketing agency and also as an independent consultant. During this time she had the opportunity to work with an array of local, national, and international brands across a variety of industries – including retail, travel and tourism, technology, and non-profit – in the development and execution of award-winning social media strategies and campaigns. This entry was posted in Community Manager Forum on November 1, 2013 by admin. This entry was posted in Community Manager Forum, Event report and tagged PR, public relations on October 23, 2013 by admin.